Due to a few new mustelids I had to move my collection to a bigger shelf. Four mounted mustelids are still missing here but they just didn't fit. 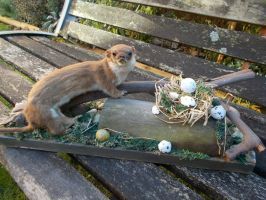 There are two mounted ones a stoat and a least weasel. The glass cabinet holds my mink (male and female), ferret, polecat, stoat, least weasel (2x), pygmy weasel and north american river otter. In the background you can see beech marten (2x), honey badger, least weasel skeleton, wolverine (on a beech marten skeleton) and a wet specimen least weasel. The front row shows three different european badgers (pathological, old grandpa and one I collected myself), an american badger and a male fisher. Wow I love this!!! Eventually I will move my big glass curio cabinet into my room when there is more space and I can display all my skulls. teeth, claws, ivory, and other things together!! I love the placement of these skulls and taxidermy its very cool and reminds me of a museum display!! Gorgeous collection!!! That skull is very massive. i someday hope to have this many beautiful skulls and curios!! I collect for like 7 years now and was totally crazy last year. Jumped from around 100 skulls to almost 200. Need to pull the brake now. dang, that's a lot. I guess there has to be a stopping point, or else your whole house will be covered in skulls, furs, and wet specimens.. Indeed, that will happen. I am fine with it though. Plus I don't collect fur anymore. This reminds me of my dads office, lots of fake sculls and trinkets. I love this work you do, keep it up. Hiya! Nice collection. It's hard to find the space though, isn't it? What are you still on the lookout for? I do have some bits for sale. Almost all mustelid species I don't have yet and skulls in general. 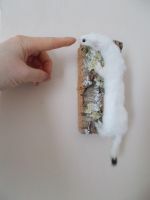 If you go to my DA page you can see the tiny ermine (wall mounted) (left) and the weasel on the base I made for it (right). Let me know if you're interested in any of these and I can give you a price and some pictures. You've got some stuff for sale? I am very interested in collecting this sort of stuff! I do, but I'm in the UK and not sure of all the laws around shipping to you in the US ? ! Especially skulls and taxidermy. The rules are quite confusing. I would suggest that you check etsy though, it's a great site for finding odd stuff and they're sure to have great stuff from the good ole US of A.
I collect for 7 years now and got totally crazy last year. Upped from 100 skulls to almost 200. I'm dying to own a canine skull some day. This is honestly a beautiful collection. If you are interested... I will sell some from time to time. Oh yes I'm very interested! I went crazy last year and jumped from 100 to almost 200 skulls. Das stehende Wieselchen ist einfach nur Zucker ^^ Die Pose der Vorderbeinchen ist einfach nur awww! this is such a nice set up and the mounted ones are incredibly cute! From a taxidermist from the UK.